We have seen both spy shots and official photography of the 2014 Chevrolet Camaro SS in coupe and convertible form but we haven’t heard much about the V6-powered 2014 Camaro Convertible– until now. As is the case with the 2014 Camaro SS Convertible, the 2014 Camaro 1LT (or it could be a 2LT) Convertible is very similar to the current 2013 model year Camaro between the wheels but the front and rear ends have been refreshed accordingly. More interestingly, the V6-powered version of the 2014 Camaro Convertible sports a lower front fascia that is vastly different from that seen on the 2014 Camaro SS. One of the most prominent features of the refreshed 2014 Chevrolet Camaro SS is the big, bold lower fascia that has a huge, rectangular opening in the middle flanked by a pair of smaller square openings on each side that hold the fog lights. As you can see in the images here of the Blue Ray Metallic 2014 V6 Convertible, the “base model” Camaro has a much less aggressive front fascia with a more rounded design with a smaller lower grille opening, a larger area of “bumper” between the upper and lower grille and fog lights that are tucked into small, circular openings rather than the large vents of the SS package. Next, it appears as though the front fascia of the 2014 Camaro V6 does not reach towards the ground as far as the Camaro SS front end and where the lower corners of the SS front fascia flare out – the V6 front end appears to taper in a bit. Also, while the 2014 Camaro V6 Convertible wears a similar cowl induction style hood, it does not have the louvers that are found on the 2014 Camaro SS. Out back (and along the sides), this 2014 Chevrolet Camaro V6 Convertible appears to be near identical to the shots of the 2014 Camaro SS Convertible including some big, bright aluminum wheels, a low profile rear spoiler, a lower rear fascia that runs up into the middle of the rear bumper area and a set of polished quad exhaust tips – although I suspect that those exhaust tips are likely part of the V6 RS package. One key difference along the sides of the 2014 Camaro V6 is that it does not wear the big Brembo brakes that have been seen on all of the 2014 SS test cars sop it appears that while the RS package adds high tech headlights, quad exhaust tips and perhaps those aluminum wheels…it does not include a braking system upgrade. 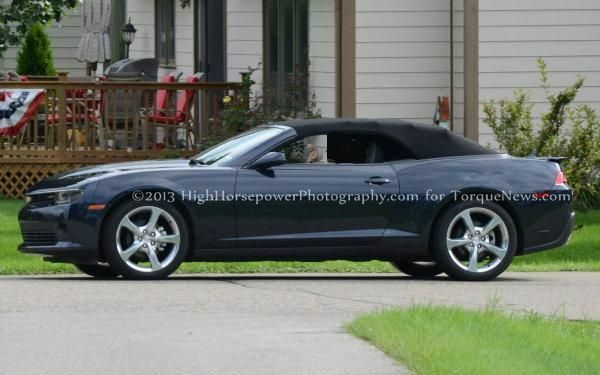 A final interesting note on the 2014 Chevrolet Camaro V6 Convertible shown here. As the driver sped away from me and my trusty Nikon, it seemed to be quite a bit louder and “throatier” than the current V6 Camaro. It sounded similar but even at low speed and low RPM, this 2014 test car clearly announced its presence – and the fact that it was a V6. The 2013 and older 5th generation Chevrolet Camaro offered some minor styling differences between the V6-powered LT models and the V8-powered SS models but with the refreshed 2014 Camaro – GM has clearly made a move to help differentiate the V6 and V8 models more clearly. While some buyers might wish that their 2014 Camaro LT Convertible had the same ultra aggressive front fascia as the new SS Convertible, the look of the new V6 is similar to that of the current models – a look that has made the Camaro the bestselling muscle car in the US several years in a row. This is the second time that Ive stumbled across a 2014 Camaro Convertible – having first caught the new ZL1 droptop chilling at Tim Hortons. Click here for a closer look at that new Camaro!